Home poultry-keeping is one of the fastest-developing grow-your-own sectors. 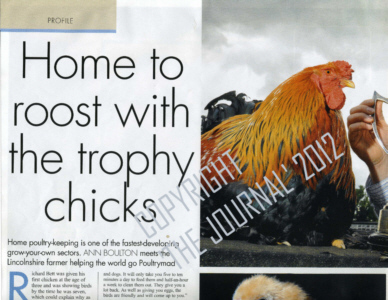 ANN BOULTON of ‘The Journal’ meets the Lincolnshire farmer helping the world go Poultrymad. Richard Bett was given his first chicken at the age of three and was showing birds by the time he was seven, which could explain why as an adult, he named his Lincolnshire-based business Poultrymad. To most people, self-sufficiency means cultivating your own fruit and vegetables. Yet Richard says that over the past two or three years, keeping poultry has become the fastest developing "grow your own" sector. And he should know as he supplies chickens and ducks all over the UK and beyond, together with the necessary housing and expert advice. Not that his customers need too much advice because, according to Richard, there isn't a lot to keeping chickens. "As long as they get the right housing and the right area to live in. they're happy," he says. "A six-foot square area is enough for two chickens. And what could be better than eating your own eggs, knowing exactly what the chicken has been fed on and how healthy it is? Once you've done this, I guarantee you'll never buy eggs from a shop again." Poultrymad is based at Richard's farm in Yarburgh, near Louth. He says: "To anyone thinking about it, I would say, have a go. Chickens take very little looking after. It's no different to keeping cats and dogs. It will only take you five to ten minutes a day to feed them and half-an-hour a week to clean them out. They give you a lot back. As well as giving you eggs, the birds are friendly and will come up to you." 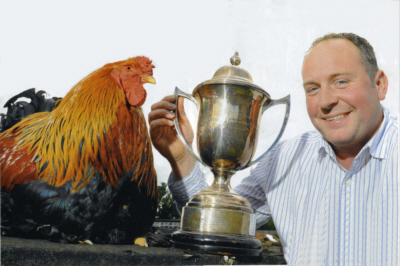 Richard was given his first chicken by his godfather and today his pride in his flock is clear to see - and rightly so because two years ago, (2010) he bred the Buff Orpington that beat 6,700 other entries to become the National Federation Of Poultry Clubs Supreme Champion. "I was 30 at the time, the youngest ever to have won it." he recalls. "That show is what you might call the Crufts of the chicken world and I was delighted to win the award. "I was lucky that I had the best tutor in the late Ian Kay. I was at his house every weekend and after school to learn from him. When I was about ten, he said he wouldn't let me into his poultry house to choose a bird as I would always pick the best!" - "To view a profile of Ian Kay, select from right"
Richard also won the Champions Trio at the same federation competition, again with Buff Orpingtons. Yet he would not advise keeping these pure breeds in the back garden, unless they are meant as pets, rather than the source of the household's eggs. "I don't like having to say it but hybrids are far more suitable for someone keeping chickens at home," he explains. "They eat half as much as pure breeds, lay about twice as many eggs and live longer. They are also inoculated against everything, which the pure breeds aren't and you never get any trouble with them. "As 90 per cent of people keeping chickens do so for the eggs, hybrids are far more suitable. It's a shame. I would love to recommend the pure breeds but it's a fact of life." Richard advises that three to six birds is the best number to keep for a plentiful supply of eggs, though two chickens will provide around a dozen eggs per week, as each one will lay about 300 per year. He designs and builds his own chicken houses in various shapes and sizes, from a two-chicken coop to a 100-chicken shed. He is now supplying up to ten of these each week, three times as many as two years ago as well as drinkers, feeders and books on chicken care. "I build the houses myself because I know what chickens want in their home," he says "A good solid poultry house will keep them safe from foxes and all you need in it are some wood shavings for the floor and some hay or straw for the nesting boxes. To keep three chickens costs about £2 a week." Such is the popularity of poultry that Richard is now looking at organizing a basic course in keeping chickens to include care and handling. He designs and builds his own chicken houses in various shapes and sizes, from a two-chicken coop to a 100-chicken shed. He is now supplying up to ten of these each week, three times as many as two years ago, as well as drinkers, feeders and books on chicken care. "I build the houses myself because I know what chickens want in their home." he says. "A good solid poultry house will keep them safe from foxes and all you need in it are some wood shavings for the floor and some hay or straw for the nesting boxes. To keep three chickens costs about £2 a week." Such is the popularity of poultry that Richard is now looking at organising a basic course in keeping chickens to include care and handling. "We do a lot of summer shows all over the country and the poultry tent is always the most popular," he says. "We get people coming up to us there or ringing up and asking questions, so we're thinking about putting on a course." Despite the increasing demand for chickens for the home, breeding and showing are still Richard's passion. A visit to his farm, bears witness to this; a large incubator full of hatching eggs, sheds for the chicks and half-grown fowl, another shed full of bantams which he also breeds and an array of his current prize specimens who, in preparation for a forthcoming show, are in cages, awaiting a bath. On a smaller scale, he breeds waterfowl, mainly Call Ducks and Indian Runners and again has found demand increasing. Customers for Richard's chickens come from the length and breadth of this country, as far afield as Kent and Lanarkshire and he supplies all over Europe. "I get the same people coming back every year to buy a couple more chickens," he says, "I also get people calling from as far away as Pakistan, but many of them don't come to anything, although I have supplied chickens to the Middle East. "One day I got a call from a man in Romania wanting some Gold Brahmas. He said he would be here on the Saturday morning but I'm afraid I was a bit sceptical about whether he would. However, at 8:00 am, there was a knock on the door and there stood the Romanian and a friend - and one of the oldest, most battered vehicles Richard had ever seen. "They had driven for two days in this old car." he says. "I had to run around to my sister-in-law, who is the local vet, to get all the paperwork done. We crated-up 30 chickens and away they all went. I got a call a couple of days later to say they had arrived home and the chickens were fine." His godfather gave Richard his first bird at the age of three and with his farming parents also involved in showing - dogs in his mother's case, while his father showed rabbits. He had good examples to follow. "When I started doing well at shows, I wanted more so I went on to different breeds," he says. "I always go for the best so I can reproduce good stock to show and I go wherever I can find them. I have been to Germany and Ireland to buy chickens." Richard is modest about his achievements and simply says that he lets his birds do the talking, but he is obviously delighted that more and more people are discovering the rewards of owning the chickens that he breeds so lovingly. Poultrymad© is based at Manor Farm, Yarburgh, near Louth.